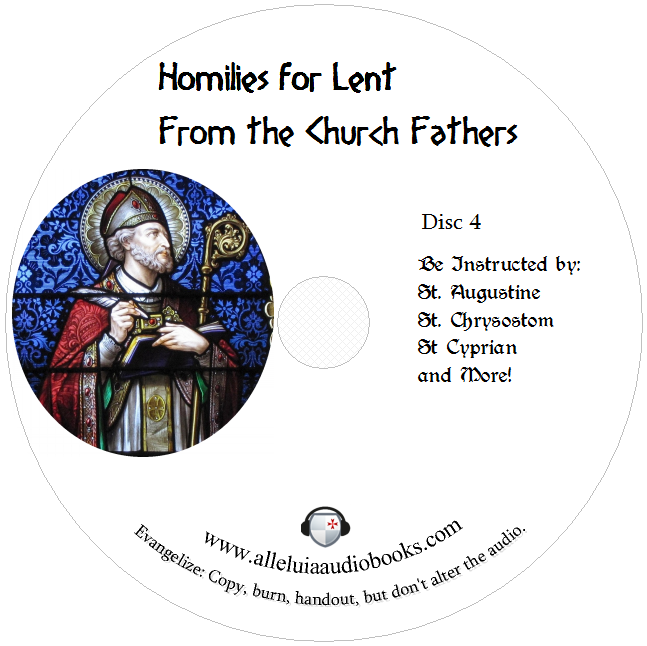 The fourth volume of the Church Fathers for lent, for the fourth week of lent. We need the guidance of the Holy Fathers of the Church more so than ever today, they were confronted with battling an immoral pagan world and Christians heavily influenced by Pagan ways and became Saints and spread the Kingdom of Heaven. You can also help spread the Kingdom of Heaven as well by sharing this web page with your friends or liking it through facebook, together we can spread the teachings of the Holy Fathers. Taking up the Cross by St. Augustine. Unity of the Church by St. Cyprian. Confession of Sins by St. Augustine. Anger by St. John Chrysostom. Right Use of Lent, Forgiveness of Injuries by St. John Chrysostom. Christ Asleep in the Storm by St. Augustine. The Good Physician St. Augustine.